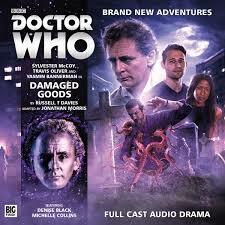 The New Adventures novel ‘Damaged Goods’ was undoubtedly an obvious choice for Big Finish to adapt for its audio range. Published in 1996 and written by Russell T Davies, the man behind the incredible success of the 2005 television revival, ‘Damaged Goods’ instantly earned its place amongst the very best written adventures as it grimly focused on very real characters with very real drama in very real settings. It’s quite easy to see the beginnings of what Doctor Who would become in the future, the definite focus on working-class families, a seeming fascination with Time Lord technology, a respectful hint of non-traditional sexuality, and even the inclusion of the surname Tyler all making appearances here. Thus, even with the darker and more manipulative version of Sylvester McCoy’s Seventh Doctor in the starring role, ‘Damaged Goods’ in retrospect proves to be the perfect link between the two televised eras of the franchise, telling an enthralling and emotionally-laden story in the process. It’s no secret that The New Adventures skewed into much darker territory than the televised series, and ‘Damaged Goods’ is perhaps a more extreme example than most due to its very contemporary setting. As the Doctor and his Adjudicator companions, Chris Cwej and Roz Forrester, arrive in 1987 London, they quickly become entwined in the mysterious events of the rundown Quadrant, racing against time to discover the truth behind an ancient alien menace somehow linked to a local gang leader known as the Capper, a young mother and son, the mysterious Frei Foundation, and the distraught Eva Jericho while a new narcotic floods the streets. The only unfortunate aspect of the audio adaptation of ‘Damaged Goods’ is that so much of the original plot must be edited to fit into the condensed audio running time. Adapter Jonathan Morris ably proves up to the task, however, as he manages to capture the spirit of the source material perfectly even if the concluding episode, by necessity, is rather more rushed than the more menacing and thoughtful pace of the first. The only character that potentially suffers from the condensing of the plot, though, is Eva Jericho, whose descent into murderous madness as her desire to exchange what she perceives to be damaged goods occurs far too quickly. Fortunately, the Tyler family comes to life magnificently and realistically with little effort, and the script and performances do a surprisingly good job of selling just what could bring a mother to make the shocking decision Winnie did all those years ago. With the young Gabriel caught in the middle of these increasingly dangerous events, the emotions and conviction on display from each of the characters with his or her different motivations are truly superb. Travis Oliver and Yasmin Bannerman are strong in their audio debut as companions Chris and Roz, respectively, but ‘Damaged Goods’ certainly does not put an undue impetus on these characters, casting them in more of a stereotypically subservient role. There will assuredly be further adaptations to flesh out these two more thoroughly since they were already established companions at the time of the original novel’s release, but they remain somewhat of an enigma for new fans after this release alone. As a straight adaptation, however, Big Finish’s ‘Damaged Goods’ is an incredible success and brings the gritty maturity to life wonderfully. With a truly spectacular and emotionally-charged performance from Sylvester McCoy and an amazingly-evocative score to bolster its incredible plot, ‘Damaged Goods’ is the perfect missing link between the classic and modern series as well as the written, audio, and television mediums.